Collagami paper is great for paper folding and orgiami. Its double-sided nature makes it perfect for flowers! Using square paper of any size such as the Collagami paper, fold the paper on the diagonal. Whilst still folded, fold one point up into the right angle corner. Repeat with the other point so the sides meet in the middle to transform the paper into a square. Fold each panel back on itself towards the outer edge. Slip your finger into this triangle, lifting up the point and opening it out so it becomes a mirror image of itself, then flatten it. Do this for both sides, so your paper reflects the image shown. Fold the two triangles hanging over the edge back in on themselves. Next, fold these outer triangles in on themselves (in half) so the overall paper shape now looks like a square again. Bring these panels together and join either with Supertac, hot glue, or a staple. You have now completed one petal. Repeat this six times and glue all of the petals together to make a flower. Thread the florist wire up through the centre of the flower and through the holes in a button, then back down through the centre of the flower, to create the stem, twisting the wire as you go. Draw on the paper before making your flower. Try using two-toned Collagami paper for a different result. 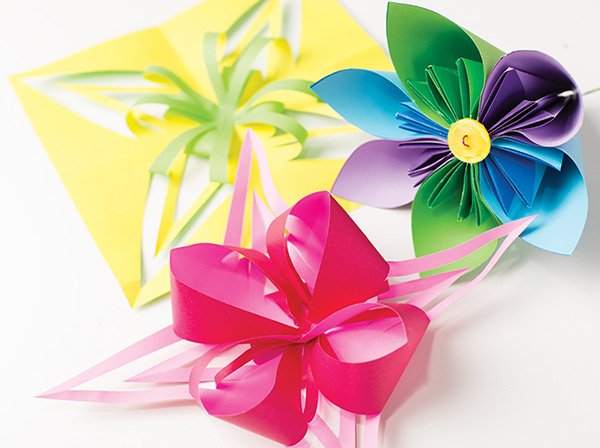 Try making a different shape flower! Click here to see how the Collagami Tessellations in the photo above are made.